I adore Jase Te Patu – he’s a man with so much heart, and so in love with New Zealand and his Māori culture. Plus he’s passionate about yoga – both the practice and the teaching of it. When he and I sat down to have a chat about Power Living’s Yoga Teacher Training here in New Zealand, it was immediately apparent how Jase has grown since we last spoke two years ago. The passionate boyishness has matured into grounded strength, tempered with an open vulnerability. And, even better, Jase was happy to talk about the journey he’d been on that had fed this shift – his health challenges, learning to adapt his practice to meet the needs of his body and becoming a warrior of light. Jase is a co-owner of Power Living Wellington, along with Justine Hamill. Power Living’s 200Hr Yoga Teacher Training begins in Wellington, NZ in May 2017. For further information on tuition costs, dates and locations visit the Power Living website or email co-owner of Power Living Aotearoa Yoga Justine Hamill at justine@powerliving.com.au. Kiwi, Māori, Brogi, Teacher, Student, Business Owner and partner are all words to describe Jase Te Patu. Coming to yoga from an injury whilst dancing in South Africa, yoga has led to a huge shift in Jase’s life. He has trained with a wide range of teachers including Les Levanthal, Ana Forrest, Eion Finn, Mark Breadner and Tiffany Cruickshank, but it was Power Living Teacher Training that transformed Jase’s whole yogic journey. Jase is a qualified Group Fitness, Dance and Performance teacher. 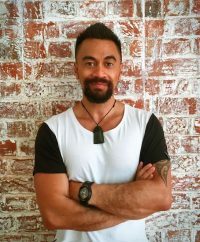 He has choreographed for Les Mills International and performed with New Zealand’s top entertainers as well as in Australian touring shows the ‘Lion King’. ‘Miss Saigon’ and ‘Jersey Boys’. Jase is co-owner of Power Living ​Aotearoa Yoga and facilitates retreats and 200hr Teacher Training. He has presented at Wanderlust Festivals and teaches strong and inspiring classes at our Wellington Studio. My wife and I caught a class with Jase at Powerliving when we were in Wellington recently. A fun, motivational and inspiring teacher. Also, both being Maori, it turns out we are most probably related!